Poster design......Drews & Rowe, Washington, D.C.
March-April, 1988 at Studio 603, 311 West 43rd St. NYC. Hell's Kitchen, sometimes called Clinton or Midtown West, is the Manhattan neighborhood that runs from 34th Street to 59th Street and from 8th Avenue to the Hudson River. Though somewhat "gentrified" by real estate developers in recent years, the population is still mainly multi-ethnic, lower middle class working families, with a significant number of aspiring actors taking advantage of the low-rent tenement apartments and the proximity to the theater district. The basic tenement design is the railroad flat with all the rooms in a row, the bathtub in the kitchen and the toilet in adjacent closet. The play is about one such tenement and the aspiring actress who lives there. The history of the Hell's Kitchen neighborhood includes 19th century street gangs like The Parlor Mob, the Dead Rabbits and the Gorillas and the "strong-arm squad" of police from the 37th Street station that battled them. Neighborhood residents who patronized the stand of Henry The Frankfurter Man at 40th Street and 9th Avenue knew enough to avoid the dangerous alley on 41st Street between 9th and 10th Avenues that was known as the League of Nations. The old 16th Precinct stationhouse on 47th Street saw appearances by Mae West and Legs Diamond, who were booked there not by their agents but by the local police. 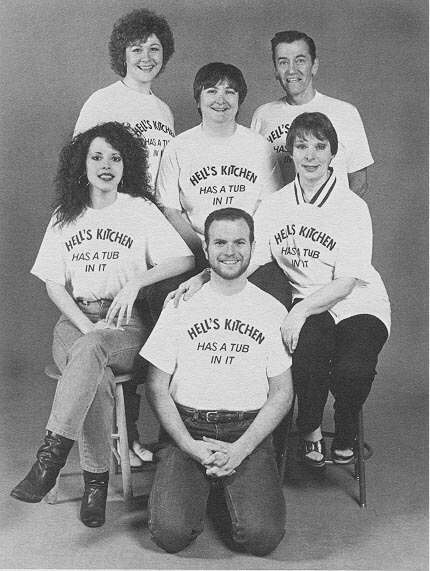 Hell's Kitchen has spawned the famous, like U.S. Senator Daniel Patrick Moynihan and boxer Johnny Dundee, who was both world featherweight and world junior lightweight champion, and the infamous, like the recently convicted "Westies" gang of murderers for hire. Hell's Kitchen Has A Tub In It follows a succession of creative works set in the neighborhood, from Tenth Avenue Angel, a 1948 film starring the young Margaret O'Brien, to the now classic West Side Story. Bill Herries, "The Old Westside Hell's Kitchen"